The story was great, the writing well done, and the concept extremely interesting. I liked the characters and saw how they grew, but the main character, Ember, annoyed me half the time. I may be old, but I do remember the rashness of youth, but even that doesn't explain some of the stupid decisions Ember makes. It was annoying. 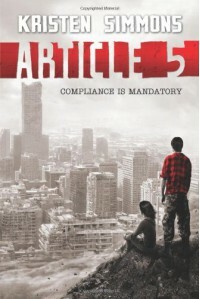 That was one reason I couldn't give Article 5 a 5 star review. The other reason was the lack of explanation regarding the world. The author never fully explains WHY people live as they do or what exactly happened. It's hinted at, skimmed over, somewhat, but I'm still in the dark. I kept wanting more backstory about the world and less memories about Ember and Chase. I also wanted more information about the mom. There was no hint about her lifestyle or about why article 5 would relate to them until the 'incident' (hope I'm not giving spoilers). I liked how the book jumped immediately into action, yet more information throughout would have been nice. Still, Ms. Simmons did a great job with and interesting concept and I hope she goes into more detailing in the following books (the end was obviously set up for more books). I'll definitely read them.